(i) (a) A Master’s degree in Criminology or Forensic Science; or (b) B.A. degree in Psychology or in Philosophy with Psychology as one of the subjects of study. Other things being equal, preference shall be given to candidates who have had training in correctional work in any School of Social Work or experience in management of Children’s Homes especially of Juvenile delinquents; (Refer Annexure - I) and (ii) Must be atleast 145 (One hundred and forty five) centimetres in height and 71 (seventy one) centimetres round the chest with an expansion of atleast two centimetres. Click the FACEBOOK ICON below To get Alerts of All Job Notifications from WAY2TNPSC Interested and Eligible Candidates can apply before 15-Mar-19. Keep on reading this page to know all the above details. So, it will be helpful to know the procedure and details for the candidates who wish to apply for this particular vacancies. 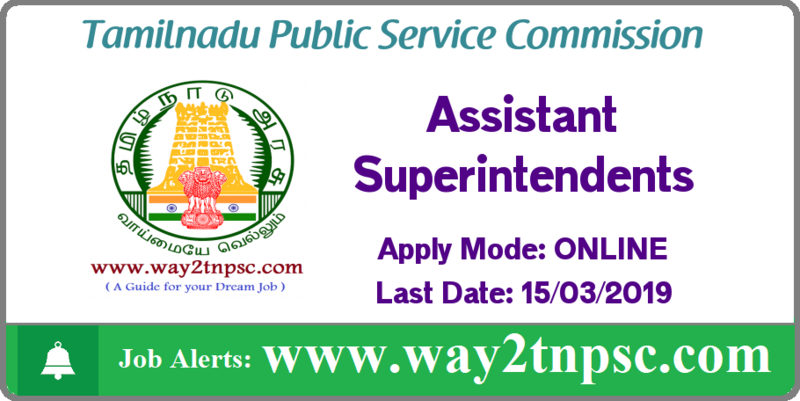 The above Notification ( TNPSC Recruitment 2019 for Assistant Superintendent Posts | Apply online ) briefly describes about the details of latest announcement or notification includes important dates like release date , last date of application submission, details regarding fees, exam timings. Candidates, check all the needs and apply accordingly.